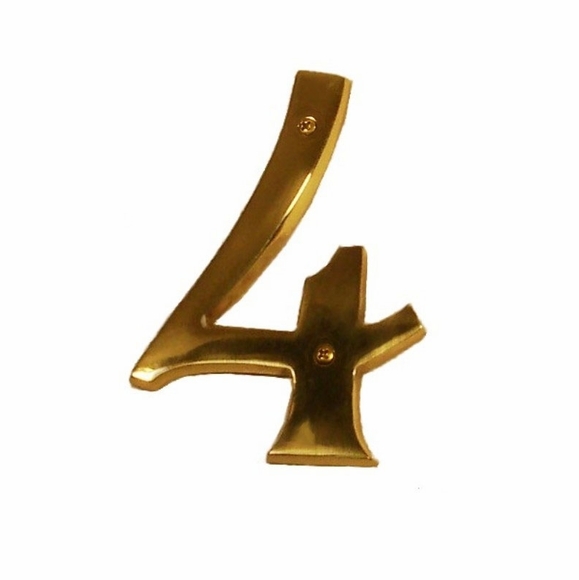 Individual 6" Brass Numeral - - 18 different finishes available! Easy to read, raised brass address numbers in your choice of color. A quick and way to update your front porch and upgrade the overall curb appeal of your home. Please order numerals one at a time. With 18 different finishes, you're sure to find one that is perfect for your home. aged brass: realistically replicates the look of real antique brass hardware, including its imperfections and soft patina. antique brass: solid brass that is chemically darkened and highlighted with an abrasive to simulate aged brass. Typically medium brown with golden overtones, but color can vary significantly from batch to batch. oil rubbed bronze: chemically darkened surface designed to simulated aged bronze. Color varies from deep chocolate brown to dark gray and usually has reddish undertones. satin brass: brass that is dulled and coated with gloss lacquer. gloss red, gloss white, gloss black: powder-coat designer colors. satin nickel: nickel plated brass that is satin finished with an abrasive and lacquer coated. antique copper: copper plated brass, chemically darkened to simulate aged copper. Typically a medium black with copper undertones, but color can vary significantly from batch to batch. antique nickel: nickel plated brass dulled and darkened to simulate pewter. polished nickel: nickel plated brass polished to a high shine and coated with clear gloss lacquer. venetian bronze: oil-rubbed finish applied over copper plated brass. Chemically darkened to simulate aged bronze. Dark color varies from deep chocolate brown to dark gray with distinct copper highlights and undertones. Matte-lacquer coating. weathered black and weathered rust: powder-coat, satin-textured finishes. All finishes are shown above. Individual numbers are 6" high and range from 1.3125" to 4.125" wide. If space is a limitation, please measure carefully before ordering. Additional note from the manufacturer: all sizes are approximate and can vary slightly. Custom finished just for you. Please allow 2 weeks for delivery for all finishes except polished chrome. Please contact us if you require polished chrome. Special Order. Sorry, we do not accept returns on Individual 6" Brass Numbers. Each number includes exposed wood-mounting hardware with matching finish.